India is planning to start a special train from Chennai for Buddhist pilgrims visiting the country from Sri Lanka. India and Sri Lanka were forging ahead with close religious and cultural ties, Indian High Commissioner Ashok K Kantha has told an international Buddhist conference that was inaugurated by President Mahinda Rajapaksa. Indian Railways was planning to launch a special Buddhist Train “Dambadiva Vandana” (Indian Pilgrimage) later this year from Chennai to cater specially to Sri Lankan pilgrims, the High Commissioner announced. An exposition of the Kapilvastu Relics (of the Buddha) will take place in Sri Lanka later this year while an Indian section will be set up at the International Buddhist Museum in Kandy, Sri Lanka.There would be a specially crafted idol of Lord Buddha in Sarnath style from the Gupta period at the entrance of the International Buddhist Museum complex in Sri Dalada Maligawa, or the Temple of the Tooth in Kandy, the High Commission in Colombo said in a statement. 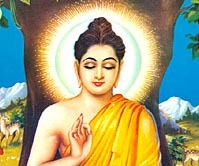 India had sponsored the Buddhist conference.